There’s nothing like an upcoming beach holiday to get you motivated! Do I care about being “bikini body ready?” Nope. But I DO want to feel comfortable getting about in next-to-nothing in Malta for two weeks, and right now I don’t. So, here’s me holding myself to account; nothing is stopping me from making sure I get some kind of workout in for the next 30 days. I’m also back on the MyFitnessPal app for good measure, it’s a pain, but tracking what I eat and inputting my exercise definitely helps me to keep it up. Day 1: Morning Muay Thai class. 1.5 hours. Lots of pad combinations, short set of sprints at the end. Day 2: BJJ with the morning crew. 30 mins drilling technique, 35 mins sparring rounds. Day 3: Morning Muay Thai class. Jose began the class by asking if any of us were sick – then he proceeded to punish us with a crazy 1 hour 15 min workout. Timed pad combos broken up with burpees and sprints and squats and planks and other horrors. I dread how my body will feel tomorrow. Day 4: Morning crew BJJ. As expected I woke up feeling like I’d been hit by a truck from yesterday’s session. 30 min drills, we had to stack each other and it’s hard for me on a normal day, but after a few days of exercise in a row my body is about as bendy as a steel rod. 30 mins rolling rounds, got my nose squished, a close-but-not-quite sub on Matt and now it’s off to work. Day 5: TGIF! Had a much-needed sleep in after four early mornings in a row. Going to get my fitness on by walking home from my work in Holborn Circus. Takes about an hour, and my body wants something low impact today. Update: Walking home successful, got a little wet (didn’t bring a brolly OR a weatherproof to work today, doh!). 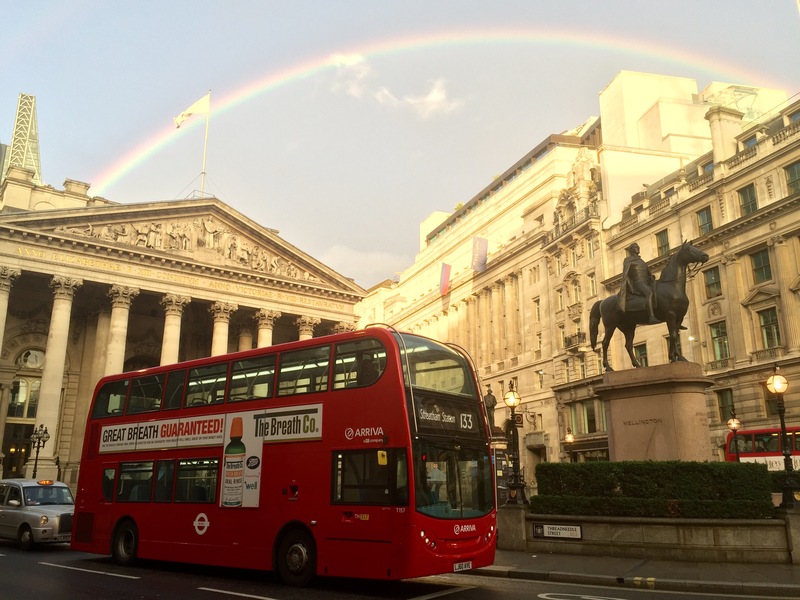 But I scored a rainbow for my troubles. Day 7: There were a few activities I could have easily done today, but for stupid, mostly lazy reasons, I didn’t. Fail day. On a bright note I did catch up with an old friend, and I smashed out three freelance articles. Day 8: Another nope day. I even packed my Muay Thai gear for evening class, but tired and cranky won. Day 9: Back to it! Amazing how much better you feel after a good sleep. Just finished BJJ class with the morning crew. Didn’t get a sub but did have side control and mount on Pete for a solid time in rolling rounds. This rarely happens with anyone so, pretty happy. Day 10: Ashamed to say it was another nope day. Traveling for work, got to the hotel late and smashed a wheel of Dutch cheese instead of smashing out some sit-ups. Day 11: Well I didn’t pig on cheese today, but I didn’t work out either. We did a two-hour Amsterdam walking tour so I guess it wasn’t all meetings and work meals. 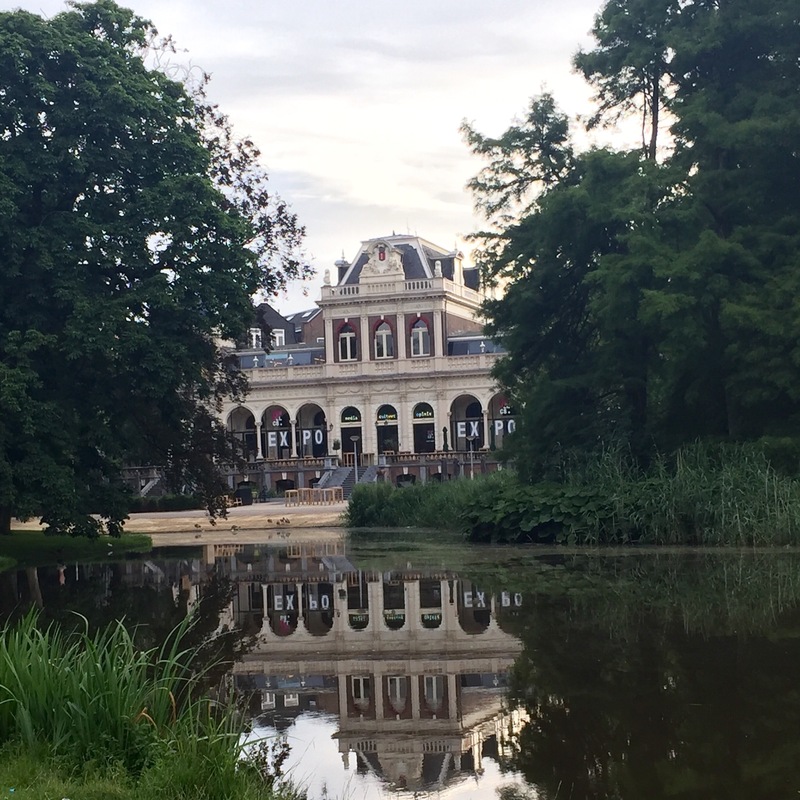 Day 12: Got up early and took my skipping rope to Vondelpark for 30 mins of skipping and sprints. Feeling great for getting sweaty! Would you wear this while you roll? So the RollTec Rashguard went live on Kickstarter today; “the world’s first wearable technology made for grapplers.” What do you think? For me, I think wearing a rashguard with a sensor in it when I roll would confirm what I already know; I spend waaaay too much time and energy trying to defend myself from under mount and side control! But I see how it could prove to be quite the motivator, and maybe even help me out of my long-term-white-belt funk. I’m not really on the wearable tech-train (I don’t own an Apple watch or a Fitbit) but I DO like using the MyFitnessPal and Runkeeper apps on my iPhone. When I use them consistently they give me that nudge to stay on track with my good eating, or extend my park runs by just a little longer each time. So, maybe wearing the RollTec Rashguard and seeing my position breakdowns (the four fundamentals) and roll timeline on the accompanying app will motivate me to break out of my usual routine? The app’s “suggested technique” videos are appealing, often I want to change things up on the mat, but am not quite sure what would make sense to try differently. Bluetooth range for the rashguard is about 30 feet – this might be an issue if you don’t keep your smartphone in the room with you when you train? Am I going to order a RollTec Rashguard? Undecided. Part of me is inclined to wait and see, and maybe jump in when they release version 2 which, I’d imagine, would likely have greater accuracy and added functionality. Then again, version 2 won’t happen if version 1 doesn’t, and it would be a shame not to see this ‘smart’ rashguard brought to life. There are lower amounts you can pledge to show your support without buying the rashguard so, either way I’ll definitely be supporting it. Author gypsy girlPosted on June 6, 2016 June 6, 2016 Categories Brazilian Jiu JitsuTags apps, BJJ, Brazilian Jiu Jitsu, crowd funding, fitness, Grappling, kickstarter, sensors, wearable technologyLeave a comment on Would you wear this while you roll? It’s been a long time coming, a LONG time going by the “usual” white belt journey depending on how you look at it.. but I’ve finally earned myself a second stripe!! It’s a big deal – huge – because it’s the first one from my coaches here in London, Marco Canha and Bruno Ferreira, and a whole 2+ years since my last one. Bruno’s morning classes at Fightzone have provided me with some much-needed motivation and consistency over the last few months. Work and other competing evening commitments mean night classes are regularly pushed aside, but 7am twice a week? Perfect for this early bird! In these classes I have found a really wonderful, encouraging crew and an attentive coach who couldn’t be more supportive and positive. I can’t train five days a week and that’s ok! Other white belts will start after me and progress faster than me, and that’s ok too! I’m going to have lower back issues every so often, and I need to listen to and rest my body. I’m not super flexible, but it doesn’t mean a move can’t still work for me in SOME way. 2015 has been a turning point year on a few fronts, all of them good. I think this second little stripe turned up at the time it was meant to, and I’m now really excited to work towards the third! Author gypsy girlPosted on November 30, 2015 November 30, 2015 Categories BJJ, Brazilian Jiu Jitsu, Martial ArtsTags BJJ, Brazilian Jiu Jitsu, TrainingLeave a comment on Second stripe happened! 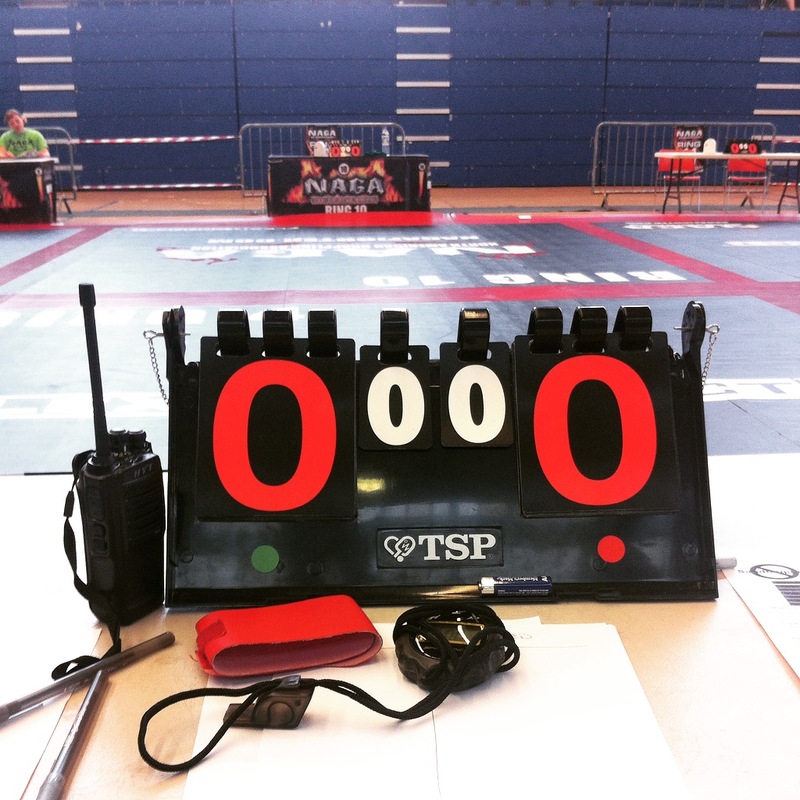 I got a new perspective on BJJ this weekend – from behind a scoring table at the North American Grappling Association’s (NAGA) UK championship. A fellow jits girl recruited me to be a ring coordinator for the day, and the role was exactly the type of jiu jitsu involvement I had been looking for. No competition nerves, just a little anxious about not wanting to mess up the scoring of anyone’s fights! 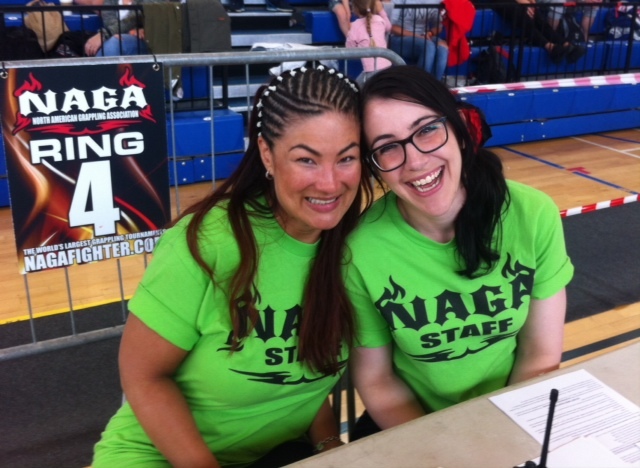 All the NAGA staff were super welcoming and supportive of us local ring-ins, training us in our roles in the morning before doors opened at Crystal Palace National Sports Centre. I can happily report that no scoring mess ups occurred (to my knowledge), and my fear of being yelled at by some aggro fighter or parent of a little kid didn’t happen either, phew. There was one fight that ended in 7-0, and the friends of the losing grappler started abusing the referee, calling him racist and incompetent among other things. Huge respect for how the ref handled that, and the other mini dramas that cropped up during the course of the day; from crying kids and parents unhappy about the range of experience in their child’s weight division, to a couple of friends who had road tripped to London together from elsewhere in Europe, only to find themselves up against each other in their first fight. I was expecting a late night after friends warned me that NAGA events usually run over by quite a lot. But the final fight was wrapping up by around six-thirty, and we were well done with the pack up by eight. 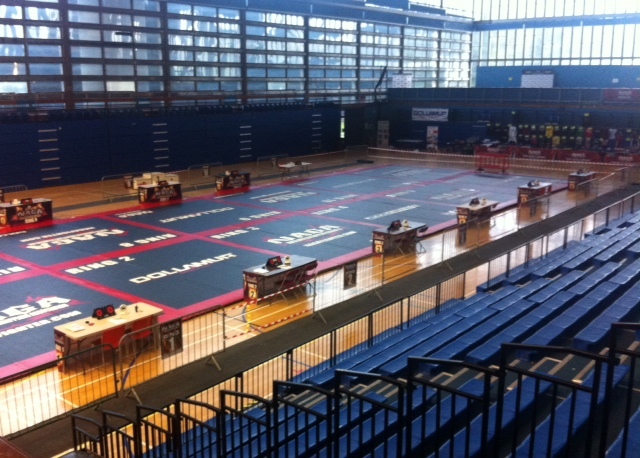 All the mats and merch and medals were loaded on to a big truck to make their way to the next EU competition in Monaco. Towards the end of the day President Kipp Kollar announced that more than 600 fighters had competed – a pretty sizeable amount to me, but apparently not as big a turnout as at some of their events in America. In saying that Kipp says the UK competition is growing each year. I had a great time working NAGA (yes I was paid), and have a new level of respect for people who run grappling tournaments. They really do work their butts off to put on a good show. I am happy to report that while the BJJ training has been lacking, other aspects of London life have been full-on in mostly fantastic ways.. I’m starting a new job soon – just after Easter in fact and I am looking forward to it so, so much. My new dream career took a bit longer to manifest in this city than I anticipated and while I have had a blast in the random occupations I have found myself in, I am definitely ready to feel back on track and placing my feet firmly on the rungs of what I feel is now the right career ladder for me. There has also been a pretty amazing guy in my life over the past few months and I am enjoying that relationship immensely. After spending the majority of my late twenties single and dating prolifically, it’s such a joy to click with someone and be as wrapped up in them as they seem to be in you. And he trains so, you know – bonus points! 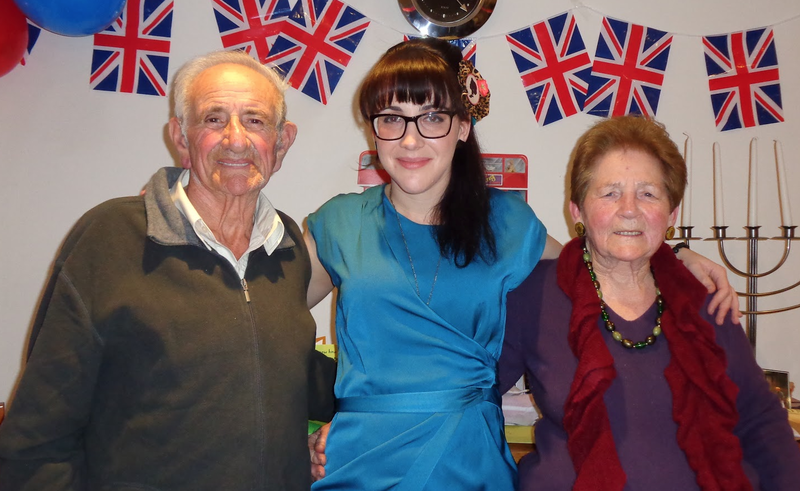 With Nanna and Nannu at my ‘leaving for London’ party… golly back in 2013, how did THAT happen?! Author gypsy girlPosted on March 20, 2015 April 1, 2015 Categories Don't Be A Stranger, Health, UpdateTags Aspirations, BJJ, Brazilian Jiu Jitsu, Career, Dating, Easter, Goals, Grandparents, Holiday, Injury, London Life, Malta, New Job, Occupation, Relationships, Single, taken, UpdateLeave a comment on Where have you been? !